It has become quite popular these days to talk about stress and what to do to manage it. We mainly relate all stress only to work life or personal life. It is either pressure at work, interpersonal conflicts or expectations mismatch which seem to cause stress. On the personal front, it is more related to marital conflict or worrying about children or other family related challenges. Very recently, people have just begun to focus on lifestyle management as a way to manage stress. However, one of the most important causes of stress; mental, physical and physiological is left out completely due to lack of awareness. One of the most valid causes of stress which needs urgent attention is incorrect eating. These days, there is quite a fad to ‘be stressed’ as it is considered to be exclusively mind related. However, there is something less known is that mental stress can also be caused by eating habits. In fact in many cases, it is not some genuine adverse situations which are causing stress. It is your dietary habits which are causing stress. It is not just about what you eat. It is also about how much you eat, when you eat and how you consume your food and drinks. 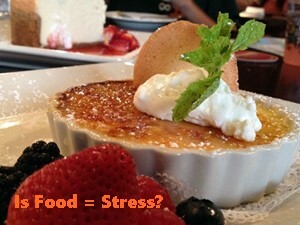 How Does Eating Cause Stress? Every time you do any of the above, you load your stomach and digestive organs with either a lot of food, unhealthy food, partly chewed food or giving it food when the body does not need it. In all these cases, the organs have to work much harder. It is the equivalent of forcing someone to work very hard, like forced labor. Gradually, the body perceives this as actual stress and a life threatening situation. This makes the body go into actual stress response mode. A lot of extra chemicals and hormones are released to manage the unwanted food. Blood is diverted from other essential functions to the digestive systems. On a prolonged basis, the body is always overworking and does not have a change to recover. The body then stores more sugar and cholesterol. It may also divert some energy from other muscles to the digestive ones. Can we now relate this with how we feel when we eat a lot or we eat at the wrong time (or heavy food and desserts)?. We feel as if we cannot move; there is no physical strength, lethargy sets in. The body wants to sleep and so does the mind. Health suffers and the mind follows. This impacts the mind and all the other organs and a cycle of stress is created. This leads to diseases like diabetes, high blood pressure, cardiac problems and even cancer. Eventually, even a perfectly happy, healthy and fit person becomes stressed due to incorrect eating and get diseases. The solution to this challenge is very simple. Eat foods which are simple and nutritious. Eat less and do not eat at the wrong times like late nights. Stop eating stress causing foods like non-vegetarian food, spicy and hot food and heavy food like bakes, breads, pizzas, processed food, sugar and refined flour. Avoid beverages like coffee and alcohol. If you want to know how to eat correctly, take one of the wellzee online diet plans or diet consultation to have a ‘stress-free’ and balanced diet plan.